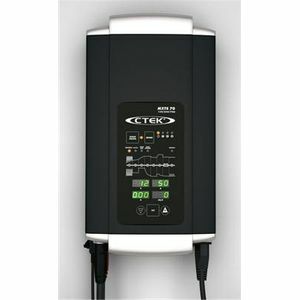 Our recommended replacement is the CTEK MXTS 70 50 12V/24V 8 Stage Workshop Charger. The MXTS 70 is a very powerful workshop charger with state of the art technology. It is developed to serve both 12V and 24V batteries, offers very sophisticated technology and is extremely user friendly. The MXTS 70 is featured with different displays showing the status of charging, charge voltage, current, charge time (h) and energy indication (Ah) for battery condition control. 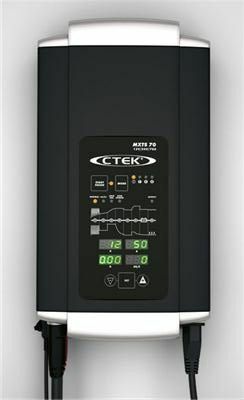 The MXTS 70 is a fully automatic 8-step charger that delivers selectable 50A/12V or 25A/24V to batteries from 40-1500Ah for 12V and 20-750Ah for 24V. The charger is IP 20 rated, housed in heavy duty aluminium for rough environments and designed to protect vehicle electronics.